The grandiose design for London Heathrow's fifth terminal will dazzle visitors to the UK. Meanwhile, a strong focus on airport systems from the earliest stages of development means that the building will make the whole airport more efficient. Future Airport looks at T5's baggage handling system. Case study: Centralised baggage handling systems at T5 will generate efficiency and reduce transfer times. When the British Airports Authority (BAA) first put forward plans for a fifth terminal at London Heathrow, it was clear that a large number of systems would have to coexist within its structure. T5’s fully integrated design and development team have therefore worked closely with a multitude of end users, each with different requirements. From British Airways through to retail and customs, the terminal has to meet with their aspirations as well as BAA’s. It was recognised that consolidating the entire British Airways operation into Terminal 5 had benefits for the larger airline community as well as the airport itself. Currently BA’s operation at Heathrow is split between Terminals 1 and 4. By centralising their operations into one terminal, the amount of inter-terminal transfers for passengers would be significantly reduced. BAA and British Airways began working together as early as 1995 to design a baggage system that was developed around well-defined user requirements. In 1997 an integrated team was formed between British Airways, BAA and the system supplier. This collaborative effort has proven vital in the development of a mutually acceptable system design. Each organisation then committed to the design of the baggage system prior to the start of construction. The underlying driver behind the design of the T5 baggage system is the achievement of predictable and consistent operational performance. T5’s baggage system will handle both intra and inter-terminal baggage. The system will process, sort and deliver bags between T5’s main building, Concourse A and its satellite, Concourse B. 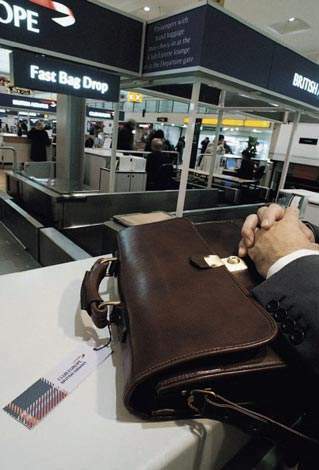 In addition, the system will handle baggage from the four other terminals at Heathrow as well as flight connections baggage transferred from London Gatwick Airport. Maintaining customer confidence in the reliability of the baggage service is vital. The baggage system at T5 has been developed to deal with a wide variety of operational scenarios and the system’s components have been selected with proven high levels of reliability to ensure a smooth day to day operation. To assist in the management of the number of different bag routings a ‘bag itinerary’ is developed upon entry to the system. This is managed and controlled throughout the bag’s journey, with any changes – such as flight delays – communicated to the baggage system controls. All bags have to go through standard processes, which have to be built into the system design. These processes include automatic bar-code scanning for identification, hold baggage screening and baggage reconciliation. Bags in the first time band are held in the early bag store, which is located in the basement of the main processing building. They are held here until called out for flight make-up, at which point they are transferred to the main baggage hall. Bags in the second time band arrive directly at the baggage hall for flight make-up. Bags in the third time band, once they have been identified on input, will be assigned a priority routing through the systems. As they are time-critical they will be delivered directly to the aircraft stand of the departing flight. As the world’s largest and busiest airport, the management of Heathrow is a massive undertaking. It is hoped that T5’s new baggage system will make the process a little bit easier.